This article is about the blizzard in the eastern United States and Canada. For the blizzard in the Great Plains, see Schoolhouse Blizzard. The Great Blizzard of 1888 or Great Blizzard of '88 (March 11–14, 1888) was one of the most severe recorded blizzards in the history of the United States of America. The storm, referred to as the Great White Hurricane, paralyzed the East Coast from the Chesapeake Bay to Maine, as well as the Atlantic provinces of Canada. Snowfalls of 10 to 58 inches (25 to 147 cm) fell in parts of New Jersey, New York, Massachusetts, Rhode Island, and Connecticut, and sustained winds of more than 45 miles per hour (72 km/h) produced snowdrifts in excess of 50 feet (15 m). Railroads were shut down, and people were confined to their houses for up to a week. Railway and telegraph lines were disabled, and this provided the impetus to move these pieces of infrastructure underground. Emergency services were also affected. Surface analysis of Blizzard on March 12, 1888 at 10 p.m. Streets in New York City as the storm hit. Many overhead wires broke and presented a hazard to city dwellers. The weather preceding the blizzard was unseasonably mild with heavy rains that turned to snow as temperatures dropped rapidly. The storm began in earnest shortly after midnight on March 12 and continued unabated for a full day and a half. The National Weather Service estimated this Nor'easter dumped as much as 50 inches (130 cm) of snow in parts of Connecticut and Massachusetts, while parts of New Jersey and New York had up to 40 inches (100 cm). Most of northern Vermont received from 20 inches (51 cm) to 30 inches (76 cm) in this storm. Drifts were reported to average 30–40 feet (9.1–12.2 m), over the tops of houses from New York to New England, with reports of drifts covering three-story houses. The highest drift (52 feet or 16 metres) was recorded in Gravesend, New York. It was reported that 58 inches (150 cm) of snow fell in Saratoga Springs, New York; 48 inches (120 cm) in Albany, New York; 45 inches (110 cm) of snow in New Haven, Connecticut; and 22 inches (56 cm) of snow in New York City. The storm also produced severe winds; 80 miles per hour (129 km/h) wind gusts were reported, although the highest official report in New York City was 40 miles per hour (64 km/h), with a 54 miles per hour (87 km/h) gust reported at Block Island. New York's Central Park Observatory reported a minimum temperature of 6 °F (−14 °C), and a daytime average of 9 °F (−13 °C) on March 13, the coldest ever for March. In New York, neither rail nor road transport was possible anywhere for days, and drifts across the New York–New Haven rail line at Westport, Connecticut, took eight days to clear. Transportation gridlock as a result of the storm was partially responsible for the creation of the first underground subway system in the United States, which opened nine years later in Boston. The New York Stock Exchange was closed for two days. Similarly, telegraph infrastructure was disabled, isolating Montreal and most of the large northeastern U.S. cities from Washington, D.C. to Boston for days. Following the storm, New York began placing its telegraph and telephone infrastructure underground to prevent their destruction. Fire stations were immobilized, and property loss from fire alone was estimated at $25 million (equivalent to $700 million in 2019). The blizzard resulted in the founding of the Christman Bird and Wildlife Sanctuary located near Delanson, New York. From Chesapeake Bay through the New England area, more than 200 ships were either grounded or wrecked, resulting in the deaths of at least 100 seamen. More than 400 people died from the storm and the ensuing cold, including 200 in New York City alone. Efforts were made to push the snow into the Atlantic Ocean. Severe flooding occurred after the storm due to melting snow, especially in the Brooklyn area, which was susceptible to flooding because of its topography. Not all areas were notably affected by the Blizzard of 1888; an article in the Cambridge Press published five days after the storm noted that the "fall of snow in this vicinity was comparatively small, and had it not been accompanied by a strong wind it would have been regarded as rather trifling in amount, the total depth, on a level, not exceeding ten inches". Roscoe Conkling, an influential Republican politician, died as a result of the storm. Edward Rutherfurd's 2009 novel New York has a dramatic section set during the blizzard. Richard Peck's 1989 novel Voices After Midnight, in which three California teenagers living in an old New York townhouse find themselves continually slipping back in time, also depicts the events of the blizzard dramatically during its climax. Rosemary Simpson's novel What the Dead Leave Behind has also been set at this time. John R. Maxim's novel, Time Out of Mind (1986) has flashbacks to this period and describes effects of the storm. BLIZZARD! The Storm That Changed America is a 2000 children's history book by Jim Murphy. In the Doctor Who Big Finish Productions audio adventure Doctor Who: The First Doctor Adventures: The Great White Hurricane, the TARDIS arrives in New York the day before the Great Blizzard, resulting in the First Doctor and Susan Foreman becoming caught up in a local gang conflict that ends with Susan and one of the gang trapped on the frozen Hudson river, while Ian Chesterton and Barbara Wright help an abused wife find and rescue her son from his alcoholic father, ending in a desperate rescue attempt when the father and son are part of a group of passengers trapped on a train that was crossing a bridge before snow forced it to stop. 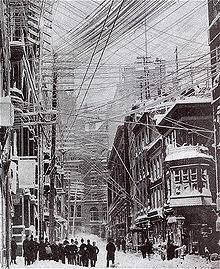 ^ a b c "The Blizzard of 1888; the Impact of this Devastating Storm on New York Transit". ^ a b "Biggest Snowstorms in the United States: From 1888 to Present". NWS Milwaukee/Sullivan, WI. Archived from the original on 24 March 2007. Retrieved 2007-12-21. ^ a b c Douglas, Paul (2004). Restless Skies. Barnes & Noble Publishing, Inc. pp. 12–13. ISBN 978-0-7607-6113-7. ^ "Building the invisible city". Virtual New York. Retrieved 2007-05-10. ^ "Climate of Vermont" (PDF). National Climatic Data Center. Archived from the original (PDF) on 2008-02-29. Retrieved 2007-12-21. ^ a b c d e f "The Big One! A Review of the March 12–14, 1993 "Storm of the Century" [With comparisons to the Blizzard of 1888]". National Climatic Data Center. Retrieved 2007-12-21. ^ "The Blizzard of 1888; the Impact of this Devastating Storm on New York Transit". ^ "Blizzard shuts down Massachusetts". Massachusetts Foundation for the Humanities. Perhaps the most important legacy of the Blizzard of 1888 was the Boston subway system. Alarmed by the paralysis and economic damage the storm caused, Boston decided to build a subway. ^ "The Blizzard of 1888; the Impact of this Devastating Storm on New York Transit". There is no overstating the significant impact this tragedy had on the metropolis, especially on transportation. The resulting standstill on the elevated lines resulted in the city adopting a plan to build subways. ^ "NEW YORK STOCK EXCHANGE SPECIAL CLOSINGS, 1885–date" (PDF). Archived from the original (PDF) on 2007-09-25. ^ "On Mar 12 in weather history". NWS Northern Indiana Weather History. Retrieved 2007-12-21. ^ "The Great Storm" Cambridge Press, Cambridge, MA, 17 March 1888. Retrieved 29 November 2014. ^ O'Grady, Jim (January 27, 2015). "Bad Idea: The Most Powerful Man in America Walks Home Through the Blizzard of 1888". WNYC News. New York, NY. ^ "New York". www.edwardrutherfurd.com. Retrieved 2018-03-09. ^ "Children's Book Review: Voices After Midnight by Richard Peck". Publishers Weekly. Retrieved 2018-11-29. ^ "Fiction Book Review: What the Dead Leave Behind by Rosemary Simpson". Publishers Weekly. Retrieved 2018-03-09. ^ Taliaferro, Frances (1986-02-09). "The Snows of Yesteryear". The New York Times. ISSN 0362-4331. Retrieved 2018-03-09. ^ "BLIZZARD! The Storm That Changed America". OCLC 41108574. ^ "New Details for Big Finish's First Doctor Adventures". The Doctor Who Companion. 2017-11-30. Retrieved 2018-03-09. "In a Blizzard's Grasp" (PDF). The New York Times. March 13, 1888. Retrieved April 17, 2012. Brunner, Borgna. "The Great White Hurricane"". infoplease.com. Retrieved April 17, 2012. Christiano, G. J. "The Blizzard of 1888; the Impact of this Devastating Storm on New York Transit". nycsubway.org. Retrieved April 17, 2012. Kovatch, Breanne (March 11, 2019). "It's been 131 years since the Great White Hurricane. Do you know about it?". The Boston Globe. Retrieved March 12, 2019. Martí, José (2000). "New York Under the Snow". In Lopate, Phillip (ed.). Writing New York: A Literary Anthology (Paperback ed.). New York: Washington Square Press. pp. 271–277. ISBN 9780671042356. Retrieved 26 January 2015. Murphy, Jim (2006). Blizzard! : The Storm That Changed America. Scholastic. ISBN 978-0-590-67310-5. Wikimedia Commons has media related to Great Blizzard of 1888.